Gutters as Storage and Shelving?! You probably have some things that could use its own space, so who would not want a little help here? We are always looking for creative ways to make your life easier and add an exciting new design to your home. I bet you thought gutters were just for just for collecting rain but believe it or not gutters offer a lot of storage options! How About A Reading Nook for Children? Make a relaxing and adorable reading nook for your children using gutters. Mount the gutter pieces to the wall and you have provided a space with the storage needed to house books and magazines in a central location. 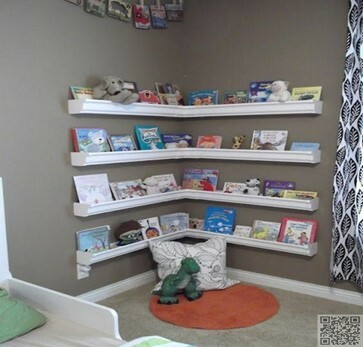 A reading nook with gutter shelves not only looks fantastic, but it is also functional and provides your kids with a quiet place to read and enjoy their books (or iPads)! When the gutters are strategically placed near a plug, they can handle all your electronic charging devices and keep those straggling cords up off the ground so they don’t get wrapped up in the vacuum cleaner! What About Gutters for Kitchen Storage? If you’re like most people, you probably don’t have a lot of storage in your kitchen! Countertop and cabinet space never feels like there lacking? How about adding some “gutter shelves” as an excellent way to put some order back in the kitchen!? Gutters can hold things like spices, small kitchen utensils, and even glasses or plates! 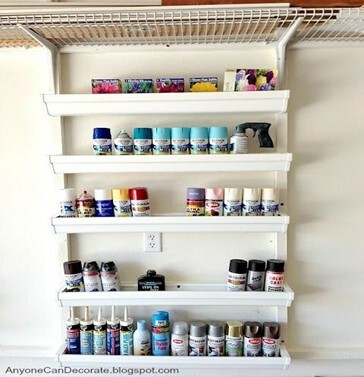 Gutter shelves can keep all of these easily organized and attractively displayed! Gutters can be installed on the walls or if you prefer to keep these things out of sight, consider putting them inside the cabinets or even in the pantry. How About Craft and Hobby Storage? Ever wonder where to keep those awkward rolls of wrapping paper? Or how to conveniently store crafting ribbon or sewing supplies? Gutters provide excellent storage for those little things’ that keep your space looking cluttered and disorganized. Gutters are even an easy way to dispense wrapping paper! Like sewing?! 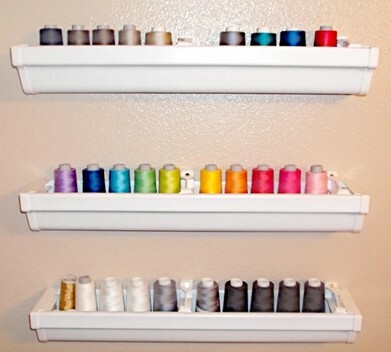 Spools of thread and ribbon are in a place and ready for use, not hiding in a basket in a closet when you need them next! Find yourself tripping over your shoes in the closet? Simply mount several lengths of gutters in your closet or by the front door to create a fantastic way to keep the entrance way clutter to a minimum and provide ample storage for even the biggest shoe lovers. By standing shoes in the gutter you can keep pairs together, eliminating morning searches and have easy access to the whole family’s footwear, keeping things tidy. It also prevents “Rover” from helping himself to a shoe or two as a snack! Oops! Garages are famous for being the most cluttered and disorganized space in almost any home! Help restore the order and get the garage in shape by installing gutters on the walls and using them to store things such as small tools, spray paint, and various things you probably don’t need. This will not only deal with the mess but make things easier to find and not to mention…make you the envy of all of your neighbors!